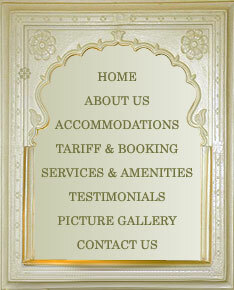 Udaipur is known as one of the the most enchanting and colourful cities of India. Surrounded by the Aravali Mountains, it is a city of tranquil lakes, sprawling gardens, majestic forts, palaces and intricately carved temples. In 1559 A.D. Maharana Udai Singh shifted the capital of Mewar from Chittorgarh and founded the city of his dreams Udaipur. UdaI Singh had many sons, the eldest was the legendary Maharana Pratap Singh and another was Viramdev. Pahuna family is the descendant of Viramdevji. The family of Viramdev were bestowed the 'Thikana' of Pahuna, near Bhilwara. Pahuna has remained the ancestral home for the Pahuna family for generations. Although the ancestral home is still in Pahuna, the present family spends most of their time 165 km away in Udaipur, where their residence is known as Pahuna Haveli. This is the home of Hanwant Singh & Hemant Kumari. Hanwant Singh, son of Brigadier Jaswant Singh worked for many years in the tea plantations of NE India & the coffee plantations of the South. 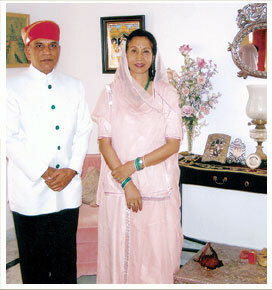 On his retirement, he and his wife Hemant Kumari returned to live in Udaipur.